This song is one labor’s anthems, and it has been reimagined over time. And the pictures document our past, our struggles, our triumphs and the continuing need of standing together. Which Side Are You On? The earliest organized autoworkers were members of the Carriage and Wagon Workers union. Check out how we went from there to here. and the exhaustion and pain of working on an assembly line leads to a potent mix on the shop floor. With political action and public opinion on their side, the Flint Sit-Down Strikers make history! UAW though the decades continues. How the UAW was officially founded and a look at the first UAW convention call. On March 7, 1932 unemployed autoworkers led the Ford Hunger March where their cries for jobs and bread were met with bullets. 4 were killed. 60 were wounded. On March 21, 1933 Diego Rivera’s Detroit Industry opened at the Detroit Institute of the Arts. It’s a stunning work of art, showing the workers at the Ford Rouge Plant, but it is just as remarkable for what it doesn’t show. to show the bosses that workers deserve the same respect as “white collar” management. Feburary 11 is now known as White Shirt Day. incredible period of organizing for our union. Each year on February 11, we remember the sacrifices and fight of our brothers and sisters in Flint, then and now, by wearing a white shirt to show we are equal to the boss. On May 25, 1937, the Battle of the Overpass took place in Dearborn, Michigan and set in motion one of the greatest organizing victories in the history of the labor movement. Between 1935 and 1943, FDR’s Works Projects Administration employed 8.5 million workers who worked on bridges, dams, airports and even created art. See a WPA mural at Local 174 depicting the history of the UAW. The ‘40s brought World War II, the rise of the corporate lobby and big changes on the shop floor. UAW was at the forefront, pushing for public policy that put workers and communities first. Sisters on the line during World War II change the face of production and the UAW forever. window as he was talking to his wife, May. Four lead pellets lodged in his right arm, one in his chest and the rest hit the kitchen cabinets. Doctors said he would lose his arm, but Reuther worked tirelessly at painful physical therapy. Eventually, he was able to regain limited use of his arm. The crime remains unsolved to this day. She’s iconic, she’s powerful and she’s UAW. Rosie the Riveter! When UAW members faced discrimination, we took the issue head on with a UAW-sponsored housing development. Works plant in Chicago were given special recognition for helping to bring the company to the table because production workers who were part of a rival union continued to cross the picket line during the strike. 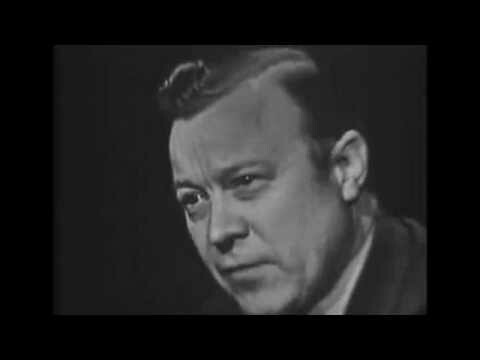 Back in 1958, Walter Reuther schooled Mike Wallace on why working people deserve their fair share. The ’60s was the decade of the civil rights movement, and the UAW played a prominent role through it all. aid in problem solving. The auto companies had previously rejected this approach because they thought it would give the UAW more time to build militancy, but they came to understand that many of the issues plaguing the worksites could be resolved sensibly through joint discussions. Graphics and art were a big part of our union and the civil rights movement. This UAW poster, made in 1960, showed labor’s support of the anti-segregation sit-ins taking place in the South. On August 28, 1963, millions of Americans headed to D.C. for a historic display of unity in the early days of the civil rights movement. inflation and more anti-union politicians meant UAW members had to step up to bat and fight hard with their own political action. Louis Sexton reflects on his memories of Walter Reuther, including how he felt the day Walter passed. The ‘70s gave members plenty of reasons to be politically active. Checkout this poster put out by CAP in 1974. It’s groovy! On May 12, 1970, UAW members turned their machines off and halted assembly lines for three minutes to honor the death of Walter and May Reuther. The ‘80s was the era of Reagan, and it was not kind to American workers. From PATCO to gutting OSHA, the ‘80s will be remembered as the decade that celebrated “greed is good” and set in motion much of what we live with today. Most people know what Ronald Reagan did to the striking PATCO workers in 1981, but what isn’t widely known was how hard Reagan courted the air traffic controllers’ union for an endorsement during the election. The March 1981 issue of Solidarity magazine celebrated the organizing victory of 900 Cornell University workers. UAW Local 2300 is still going strong, and many other higher education workers have joined them by organizing in the decades since. On September 19, 1981, half a million union members descended on Washington, D.C., in a massive show of solidarity at a time when the modern attack on workers’ rights was gaining steam. The 1990s — where the best idea to build the country was to send jobs overseas. Pressures mount on unions as the world around us shifts. But important lessons from this period tell us what can be done when the public is on your side. The long, dark shadow of NAFTA still touches us today. It is perhaps the most ominous legacy of the ‘90s as we continue to fight the same fight over jobs and unbridled profits. occurred, on and off, from 1991 to 1998 and included strikes, walkouts, informational leaflets and general acts of protest. The strikes were especially difficult because Caterpillar had no problem using replacement workers. The confrontation ended in 1998 with a six-year contract. The union agreed to drop hundreds of charges in return for the company rehiring workers who had been fired during the strikes, and reinstating over 100 workers who were fired for strike activities. On June 20-21, 1991, Action! Motown rocked Detroit as trade unionists from all over the world came to support the striking newspaper workers. The 2000s brought us the auto crisis, cheap technology and the Tea Party. The auto crisis of 2008 threatened everyone. As right-wing billionaires pull us further away from the ideals of the New Deal era, Barack Obama is elected. The auto crisis of 2008 directly affected UAW members’ lives. Republicans saw it as an opportunity to wipe out all the gains of collective bargaining and demanded heavy concessions from members. Parts-supplier workers won big campaigns in the 2000s. A short strike involving four Johnson Controls plants idled multiple assembly plants and resulted in a swift settlement with the company. The victory led to organizing neutrality and card check for over 8,000 JCI workers. In the past few months, we’ve written a lot about the UAW Through the Decades. Here’s the conclusion of the series. Our past can teach us about today. Here are are some great resources to learn more about our UAW history. This list will be updated from time to time.